This boat is long and skinny... the main hull is almost 24 ft long and about 2 ft wide on the bottom about 3 ft wide at the top. Its been on the back burner for longer than I anticipated and it was taking up valuable space and that I didn't have to start with. Loaded it up on a trailer after I secured a spot in a shop with heat and air. A purty dam good deal I horse traded with one of the best horse traders I know. He has a huge collection of toys and more than a few could use the touch of the handyman... not only that he has shade trees to boot... just might be the new home of the Shadetree Handyman. With a little luck I hope to get this thing on the water by the time warm weather gets here. 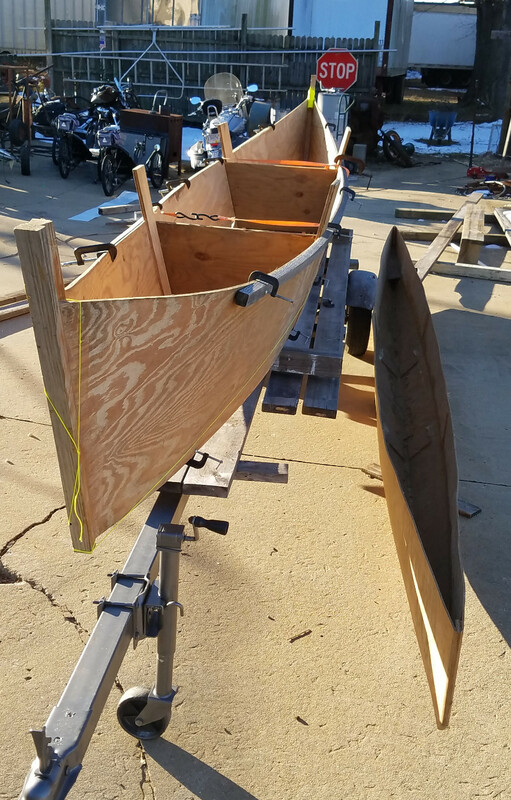 I had originally thought I would use bamboo cross beams for this proa and had planned to use three and still may end up with three... the center one would give you a place to mount a lee board and possibly an outboard motor as well... just a few of many decisions to make as I get this thing back on the front burner. Getting this out of my work area and into a closed shop with heat and air too is a huge plus. Frees up a lot of room for me and will enable me to get other things in out of the weather... and in a secure place... when I go on a road trip... which I'm more inclined to do these days.